The Turkish government spends hundreds of millions of dollars building mosques as part of a long-term effort to promote Islam around the world. Many Muslims hope that new mosques throughout Europe will advance and facilitate their wish to spread Islam to non-Islamic countries and persuade the Christian "infidels" to abandon their faith in favor of Islam. On September 29, Turkish President Recep Tayyip Erdogan inaugurated Turkey's latest European Mega-mosque, "The Cologne Central Mosque," located in the Cologne, Germany. The Cologne Central Mosque, built by Turkish-Islamic Union for Religious Affairs (DITIB) after eight years of construction work, has a capacity of 1,200 people. "It will be the most important and one of the largest mosques in Europe and Germany. It has a symbolic meaning for our Muslim brothers living here," Nevzat Yasar Asikoglu, chairman of the DITIB, told reporters. "Our mosque also symbolizes peace, brotherhood as well as the culture of co-existence," he said. The 17,000 square-meter mosque complex also has a shopping center, an exhibition and a seminar hall, a 600-people capacity conference hall, a library, working offices and a car park on the ground floor. Germany, a country of over 81 million people, has the second-largest Muslim population in Western Europe after France. 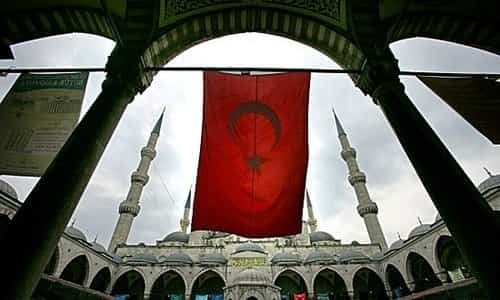 Among the country's nearly 4.7 million Muslims, three million are of Turkish origin. Meanwhile, as a huge new mosque is being inaugurated in Germany, the Christian Orthodox theological school, located on the island of Halki (Heybeliada) in the Sea of Marmara, has remained closed for almost 50 years by the order of the Turkish government. Moreover, less than a kilometer away from the shuttered Christian seminary, a new center of Islamic studies spanning a total area of 200 acres is scheduled to be built. DITIB, the group that built the new Cologne mosque, runs more than 900 mosques across Germany. These mosques are linked to the Turkish government's Directorate of Religious Affairs, or Diyanet, which provides imams to DITIB mosques. The German media recently reported that the country's intelligence service is pondering putting DITIB under surveillance, following its involvement in several scandals, such as its imams spying for Turkish diplomatic posts, its refusal to attend an "anti-terrorism march" in Cologne, its calls on worshippers to pray for a Turkish military victory against Kurds in northern Syria, and holding a military re-enactment involving Turkish flags and fake guns handed to child "martyrs." Opposition to DITIB's activities in Germany is also growing. "Those who spread nationalism, hatred of Christians, Jews or people of no religious affiliation and spy here at the behest of the Turkish government cannot be a partner in the fight against religious extremism in Germany," a member of the parliament, Christoph de Vries, said. Meanwhile, the Turkish government is continuing to annihilate the Christian heritage in Turkey. For instance, the Orthodox Theological Seminary has become a symbol of the systematic discrimination that Christians have been exposed to in Turkey. The only school for training the leadership of Orthodox Christianity, the Halki seminary was closed by the Turkish government in 1971. Since then, the Ecumenical Patriarchate of Constantinople has been unable to train clergy and potential successors for the position of Patriarch. The Turkish government, which keeps the country's greatest Christian theological school closed, is spending a large portion of its annual budget on the worldwide construction of mosques. Diyanet is the government agency that is planning to build the Islamic center next to Halki Orthodox Seminary. Diyanet's total annual budget last year amounted to 8.1 billion liras ($1.38 billion), surpassing the budgets of 12 ministries, including the ministry of health and the ministry of the interior, according to the Turkish press. The activities of Diyanet include building of mosques across the world. According to its official website, Diyanet has completed the construction of mosques in places such as the United States, Russia, Belarus, Germany, Somalia, Haiti, Kazakhstan, and Gaza. New mosques are currently being built in Albania, Kyrgyzstan, Turkish-occupied northern Cyprus, Djibouti, Sweden, and England. Diyanet is also planning to build mosques in Kosovo, the Karachay-Cherkessia region of Russia, Chad, Cote D'Ivoire, Venezuela, Mauritania, Niger, and on the campus of Georgetown University in the United States. A "Turkish cultural center" is also being built in Tokyo, Japan. According to the Diyanet Foundation, Diyanet has also built mosques in Lebanon, Mali, Philippines, and Crimea. The Turkish government is promoting Islamization worldwide through its activities, which include constructing mosques, yet Turkey's deeply rooted Christianity is a dying religion. Turkey, which today contains Asia Minor or Anatolia within its borders, has more Biblical sites in it than any other region in the Middle East except Israel. Many Christian Apostles and influential people, such as Paul of Tarsus, Peter, John, Timothy, Nicholas of Myra, and Polycarp of Smyrna, among others, either ministered or lived in Turkey. The Islamization of the region was started by the Turkic tribes from Central Asia, which invaded the Greek Byzantine Empire in the eleventh century. Today, only 0.1 percent of Turkey's population of nearly 80 million is Christian -- a result of centuries-long persecution against Christians. The modern Turkish republic, founded in 1923, has nearly completed the annihilation of the remaining Greek Christians in the country through various crimes and pressures. Today's Turkish government, apparently acting in line with its own determined jihadist ideology, is building mosques in Europe and beyond, and using many of them for its own Islamic fundamentalist agenda and outreach. A weak, misguided and misled Europe seems to be eagerly submitting to this ideology.